ENFPs are known by many titles in the type community: “the inspirers”, “the champions”, “the campaigners”, “the idealists”, the list goes on and on. The common characteristic that all these titles draw attention to is the ENFP’s vision and determination. 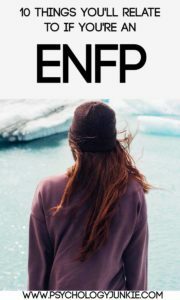 While many meme’s and stereotypes paint ENFPs to be unicorn-loving, super-chatty party animals, the real ENFP is often much more intellectual and contemplative than the stereotypes would imply. Let’s take a look at some of the characteristics of real ENFPs. Idea-generating is my strength, and the more I can brainstorm and create new ideas and envision new avenues for the future, the happier I am! I get really depressed when I’m stuck in a mundane, routine existence and I can’t imagine what will happen someday because everything is already planned out. I don’t believe in “blending in” with the crowd, and I don’t believe anyone else should have to either. I think that each person has their own unique set of values and those values should be respected (unless they hurt others). I try to mold and refine my values throughout my lifetime to make sure that they’re authentic to me and not just a reproduction of culturally-espoused rules and traditions that don’t mean anything. I get so excited when I meet someone new who has a hidden potential they don’t even know about! I automatically tune into other people’s strengths and abilities and can see a bright future for them. This is probably why I have that “inspirer” nickname! New ideas, new places, new people inspire me and make my mind buzz with unexplored potential and possibilities. I love hearing about a new philosophy or idea that will jumpstart my creative engine and get me strategizing, imagining, and asking questions. Sure, I’m an extrovert. I enjoy going to a party or sitting around the table discussing ideas over a game of Apples to Apples. But I really am not interested in small talk or surface-level conversations. The latest celebrity gossip or fashion statements really won’t excite me. I would much rather talk about the meaning of life, business ideas, adventures, our hopes, dreams, and passions! I get so caught up in ideas, theories, and imaginative potential that I lose track of what my body needs. I can forget to eat, forget to sleep, forget to drink, floss, etc,. as I get caught up in imagining all the amazing things I want to do in the future. Sometimes this backfires and I’ll “crash”, suddenly becoming exhausted, burned out, or eating everything I can get my hands on! When I was a kid, people thought I was a troublemaker sometimes because I argued so much. No matter what someone says, I can look at it from 1000 different perspectives and see the opposing side easily. I want harmony in my relationships, but sometimes I just can’t help playing devil’s advocate. Life just isn’t black and white! I like to have many different ideas and projects in the air at the same time. Nothing to me is worse than repetition and monotony. I like being in the middle of creative chaos and finding amazing solutions to complex problems…but sitting at a desk doing paperwork or memorizing facts? Please no. Yes, I’m enthusiastic and full of ideas. Yes, I’m friendly and can be the life of the party sometimes. But I love to learn and grow and am on a constant quest for self-improvement. I want to create a business, travel to Southeast Asia, read all the great philosophers, or improve the lives of marginalized people. We are usually highly ambitious, entrepreneurially-minded individuals! Do you have any points you’d like to add? Share your thoughts with other readers in the comments! Dead on. Especially eating everything, having people underestimate me, and being friendly but not being an open book. So many people say they know me so well, but they couldn’t be farther from the truth! this is me. i do belong on this planet! People thinking they know me because I am friendly and outgoing I deal with everyday It is hard for people to reconcile that I can see many sides to an argument, and yet be so singularly passionate about a given idea. And yes, I need to be talking about ideas or concepts to keep my synapses jumping. Small talk is like treading water; you’re swimming, but you’re not going anywhere!